ALLEGRA BOVERMAN/Staff photo. Gloucester Daily Times. Gloucester: The Gloucester Maritime Center works with classes at Veterans Memorial Elementary School from time to time. For the third grade science unit on rocks and minerals and sediment, the pupils learned about how fossils are created and how sedimentary rock are formed. 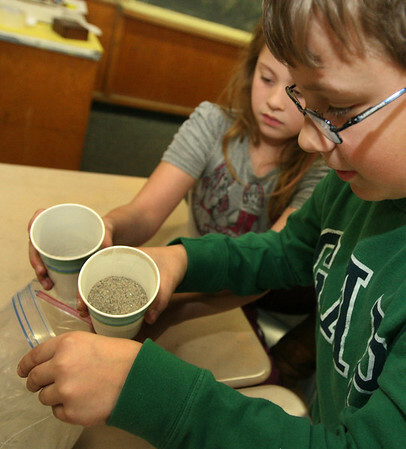 Here, Matthew Gray, front, and Samantha Skinner prepare to make a fossil of their own in an imaginery sea floor by filling a cup with sand, pressing a shell into the sand, and then covering that layer with plaster, which will harden in a few days and when the cup is dismantled, the sand poured out, a fossil imprint will remain.